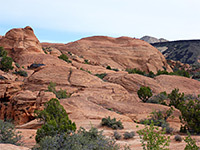 At 1.8 miles (one way), the Three Ponds Trail is one of the longer hiking routes in Snow Canyon State Park, leading across a mix of sandy and rocky terrain to a group of eroded potholes that harbor rainwater most of the year. Only the lowest pool is visible from the trail, and this is the most likely of the three to dry up since it is lined by sand rather than bare rock, which perhaps explains why the path has recently been renamed the Red Sands Trail, though its former name persists on some park maps and signs. The path ends in front of the first pool though it is easy enough to scramble up some low cliffs to view the upper two, and continue a short distance along a deep, cliff-bound ravine to the base of a high dryfall, this just outside the state park, in the adjacent Red Mountain Wilderness Area. Because of its length, the trail is rather less busy than most others in the park, but is still quite easy, with relatively small elevation changes - the most tiring section is towards the far end, where the path runs for 0.7 miles along a wide wash filled with soft sand. The varied habitat of exposed rocks, sagebrush flats, sand dunes and sometimes moist drainages result in many different wildflowers in spring, and the chance of spotting Mojave Desert animals such as the Gila monster lizard. Map of Snow Canyon State Park. 21 views along the Three Ponds Trail. Like the majority of hikes in the park, the Three Ponds Trail is served by a large, paved parking lot - along the scenic drive, a short distance south of the campground. The one path heads west, immediately crossing the paved Whiptail Trail - popular with joggers and cyclists, this follows close to the road for 3 miles, from the entrance station northwards. 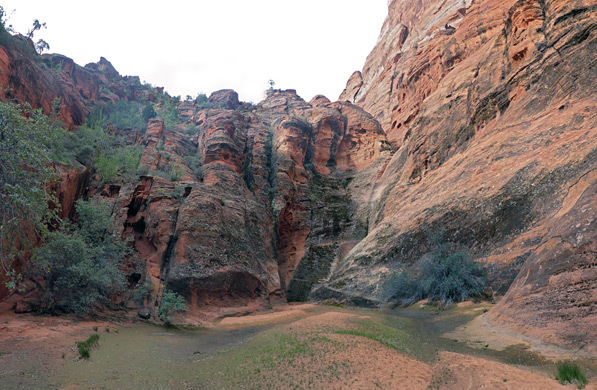 The Three Ponds Trail continues across sandy ground, entering a little valley between parallel red cliffs, lined by bushes along each edge. It soon reaches a second junction, on the right, with the Hidden Pinyon Trail, emerging from a short twisting ravine - this is a short, interpretive route which stays close to the initial section of the Three Ponds Trail. It soon leaves to the left, at a third junction, just after the main path climbs gently up a slope covered by lava blocks, and also links again with the Whiptail Trail. The next section continues, ascending gently, past some nice, angular red rock formations and through two more junctions, the first with the far end of the Hidden Pinyon Trail, the second with the Petrified Dunes Trail, another popular route that follows a smooth ridge of Navajo sandstone. 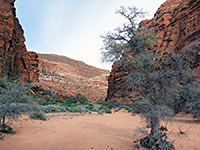 This marks the high point of the Three Ponds Trail, which now descends, contouring round a basin towards the main valley in Snow Canyon, in full view of the taller cliffs on the west side of the park. 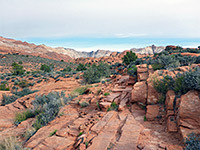 Once on the valley floor, the path crosses the stream bed, which is filled with white sand eroded from the big white cliffs to the north, and then the gravel West Canyon Road, shortly followed by another drainage, this containing red sand, from the cliffs in the west - mixed in some places by rippled flows of black lava. The second drainage leads to the three ponds. The trail stays to one side for a while, through low bushes, then descends to the streambed, where walking becomes harder on account of to the deep, shifting sand. The final junction is with the route down Padre Canyon, a south-side tributary, most of which is outside the state park. 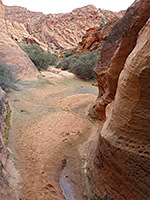 The main drainage is followed northwards another third of a mile, cutting two corners but mostly directly up the streambed, until the canyon narrows and the sandy floor ends at the base of a line of low cliffs, split by a very short slot canyon, with the first pool at the base. 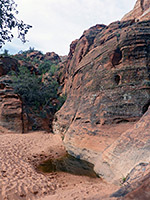 The rocks are just too steep to climb directly up (unless wading, or if the pool is dry), but a gully on the south side provides a bypass route - up a developing trail that soon reaches the top of the cliffs then drops down to the enclosed valley on the far side, where the streambed can be followed to see pools two and three. 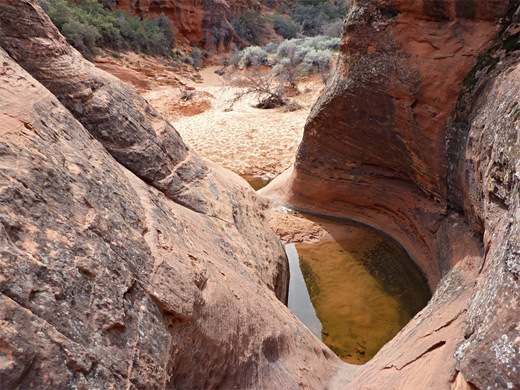 Upstream, the canyon leads to a big drop-off, below which, in wet weather, is a large, shallow pool. The floor is sandy, so the water seeps away more readily than for the smaller ponds.